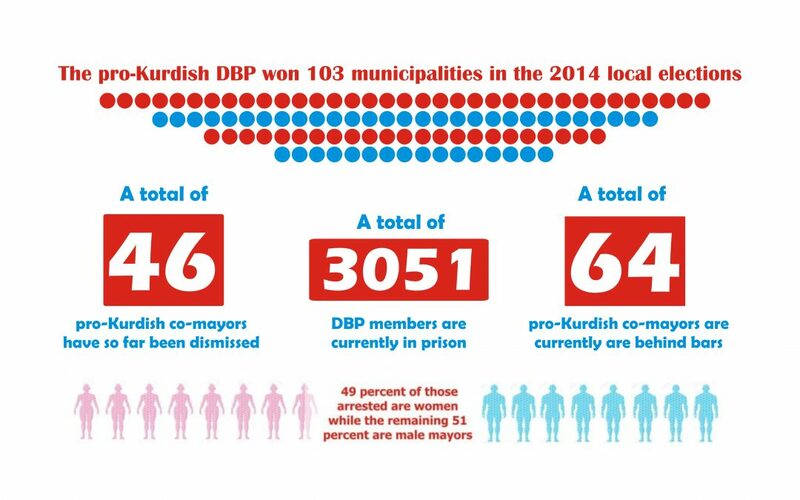 The Turkish government has arrested a total of 64 co-mayors from the pro-Kurdish Democratic Regions Party (DBP) in the past couple of months, seized the administration of 46 municipalities, and jailed a total of 3,051 DBP members, according to the Diken news portal. The pro-Kurdish DBP won 103 municipalities in the recent local elections, which were held on 30 March 2014, with some repeated on 1 June 2014. However, with Turkey has stepped up political pressure on Kurdish politicians in recent months, the gov’t appointed trustees to the management of 46 municipalities, arrested a total of 64 co-mayors, and a total of 11 deputies from the pro-Kurdish Peoples’ Democratic Party (HDP). In one of the most recent examples, on Dec 3, Turkish police detained the co-mayors of three districts of Turkey’s southeastern province of Hakkari as part of counterterrorism operations, officials have announced.